Many have ancestors of Dutch origin; some of them arrived as early settlers in the 17th century, others as immigrants in the 19th and 20th century. Dutch research requires knowledge of the Dutch language, which makes it a challenge for researchers from other countries. The good thing is that Dutch archives are full with documents that survived wars and other calamities. Many archives and collections go back in time more than 400 years. And if you are lucky, you will find traces of your ancestors back to the 13th or 14th century. An ever-growing digital collection of genealogical records makes online research quite easy. 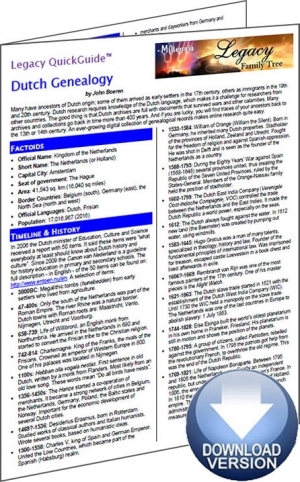 The Dutch Genealogy Legacy QuickGuide™ contains valuable research strategy to help you find your Dutch ancestors. This handy 8-page PDF guide can be used on your computer or mobile device for anytime access.